Raunchy R&B-Funk out of Seattle! Camelot Records, operated by Jan Kurtis Skugstad from 1964 to 1966, released an astounding number of 45s during its short time of existence. 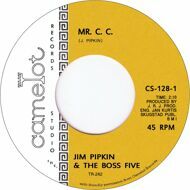 Jim Pipkin & The Boss Five's "Mr. C.C." and "Walkin' The Duck" were one of them. Camelot is best known in collector circles for two monster releases by organist Ron Buford (accompanied on vocals by Ural Thomas on "Deep Soul"). Originally "Mr. C.C." and "Walkin' The Duck" were released on two different 45s. From now on you can save your OG copies by playing this much crispier sounding re-issue.